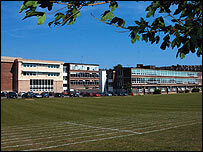 A swimming pool at a school in East Sussex is shut following the discovery of Legionella bacteria in the showers. The bug was found at Patcham High School, near Brighton, but it is not thought to be a strain which causes Legionnaire's disease. A council spokesman said: "We would not see it as a major incident or cause for concern. Pupils are in no danger." The showers and pool will remain closed until tests show no further trace of the bacteria. The school, which is maintained under a council Private Finance Initiative by engineering firm Jarvis, saw a similar incident in May last year. The showers were clear of the infection when routine testing was carried out in October, but the latest case was found on 23 March. Continued testing will be carried out, with Brighton and Hove City Council estimating that the showers and swimming pool could be open for use again within the next couple of weeks.